According to SCIA, its own tests have found that the new technology can raise the speed of software performance between two- to fourfold, which promises to greatly expedite workflows. In addition to the overhaul of internal technology and the ability to run without legacy code, SCIA Engineer 17 introduces new enhancements across five key areas, including the design of concrete structure, the design of steel structures, interoperability and BIM, loads and load generators, and overall usability. 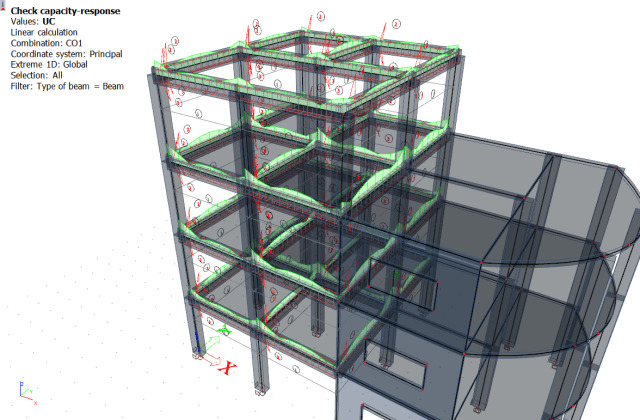 When it comes to concrete design, SCIA Engineer 17 focuses on the development of a tool that fully reflects Eurocode requirements and combines sophisticated code-based methods with usability and clarity. In order to cater to Eurocode requirements, SCIA Engineer 17 has added the shift rule to address the additional tensile force generated by the shear effect during the design of reinforcement in slabs, walls and shells. It has also provided for the design and checking of punching shear reinforcement in accordance with EN 1992-1-1. SCIA Engineer 17 further improves the speed and ease of concrete design via the use of automation for a broad range of processes, including the calculation of concrete cover, calculation of the angle of the compression strut, calculation of the creep coefficient, generation of the appropriate load combination, and recognition of support shape, orientation and position during the punching shear design process. New features for the design of reinforcement in slabs, walls and shells include calculation of longitudinal and shear reinforcement that is statically required and the use of detailing provisions for modification of the required area for reinforcements. When it comes to punching shear design, SCIA Engineer 17 can calculate punching shear for slabs and foundations and provide various possibilities for the calculation of β factor. SCIA Engineer 17 is highly versatile when it comes to deflection assessment. The software is capable of providing calculations for a specific set of members independently or evaluation the deflections for 1D and 2D members simultaneously. SCIA Engineer 17 has introduced updates to ensure that steel structure designs are produced in accordance with Eurocodes. These include extended support for EuroCode 3–related publications such as SEMI-COMP+ and ECCS Designers’ Guide to EC3, as well as the use of model-defined loads to automatically generate load combinations that are compliant with ASCE 07 and EN 1990. SCIA Engineer 17 also contains updates for U.S. codes, including the new steel codes AISC 360-16 and AIS S100-16, and national annexes for a range of Eurozone nations, including Cyprus, the Czech Republic, Denmark, Italy, Norway, Spain and Sweden. The updates promise to facilitate the design of lighter and more economical steel structure profiles by adopting the recommendations of the latest scientific research. In the case of sections categorized as class 3, such as haunches, material savings of up to 20 percent are achievable. Beyond lighter, code-compliant design, the steel design workflow also makes the final output easier to understand and more transparent, with reports that clearly show applied code clauses and 3D models that display intermediate values such as section class. 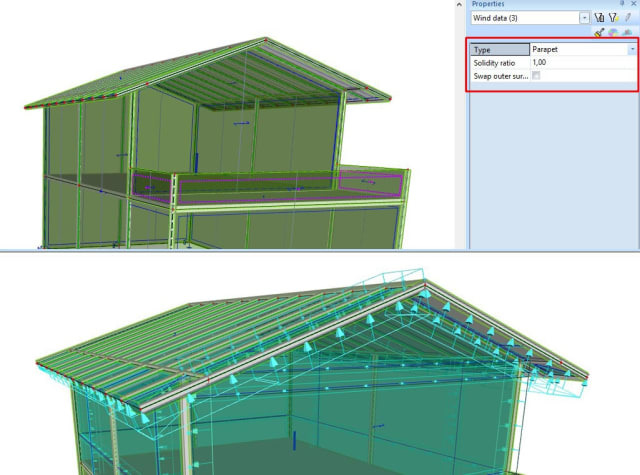 SCIA Engineer 17 brings multiple enhancements to load definition and application, which is one of the most important and time-intensive aspects of the design process. A key improvement is the use of the new tributary areas method to reduce the time and complexity of the load distribution process. The new method reduces the number of loads, facilitates verification of the generated loads, speeds up load generation and ensures precise load generation by means of a robust algorithm. In order to enhance the generation of wind loads that acts upon buildings, SCIA Engineer 17 expands the range of its 3D wind load generator to support a greater variety of features, including overhangs, parapets and free-standing walls. Given the increasing ubiquity of BIM across the architecture, engineering and construction industries, SCIA Engineer 17 provides a new means for dovetailing with the broader BIM process. A key method is the ability to link SCIA Engineer 17 with industry stalwart Revit 2018 in order to confer added functionality. This enhanced functionality includes support for high-stress concrete, improved automatic material mapping and the provision of automatic cross-section mapping for standard steel sections and standard concrete section shapes. SCIA has also worked closely with fellow Nemetschek Group firm Allplan to enhance BIM collaboration by giving engineers the ability to open up SCIA Engineer 17 from Allplan and load their models automatically, as well as take advantage of Allplan’s bim+ portal. Making SCIA Engineer accessible via bim+ will bring pivotal advantages to engineers, enabling them to share models with greater ease and engage in real-time collaboration. It will give engineers the ability to track and monitor online task management, the revision system and any relevant issues that arise. Perhaps the most demonstrable area of improvement for SCIA Engineer 17 lies in overall upgrades to the program’s usability based on the results of a customer survey conducted towards the end of 2016. SCIA has made the effort to address the three usability items that garnered the greatest number of votes from the survey, the first being improved readability for labels and result values when viewed in the 3D window, which was achieved via the addition of a “hardware multisampling” anti-aliasing option and an improved default font. The other leading usability items include the ability to conduct analysis for selected load cases and/or combinations alone and the ability to use a single click to export the table input and table results to a Microsoft Excel file. Aside from addressing the three biggest usability concerns of engineers, SCIA Engineer 17 comes with a slew of other features to improve the ease and speed of operation, including a greater range of keyboard shortcuts, single-click behavior for the main tree menu and a format painter that permits the quick transfer of properties between members. Usability involves more than just the interface for operating a software application; however, it also involves the display and documentation of projects in a way that is accessible and easy to understand. To this end, SCIA Engineer 17 has sought to upgrade its display of results as well as its integrated reporting tool. It comes with a range of new display options to make data results easier to comprehend, including a legend for pictures, with results both on screen and in the engineering report, and a rainbow palette for the result diagrams on 1D members. SCIA Engineer 17 provides a greater range of display options for the results in sections for 2D members, including the display of just a single section or all sections, adjustable color schemes and graph types, and draw results in section planes, element planes and upright-to-2D elements. 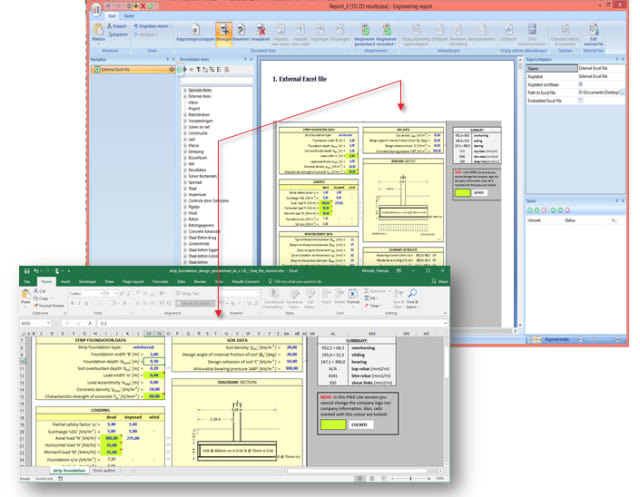 Results for nodal and linear reactions can be displayed in a single view, while users can also access displays of the real minimum-to-maximum envelope with respect to combinations and the critical linear combination within envelopes for results. In order to improve documentation and reporting vis-à-vis other project stakeholders such as contractors, investors and local government, the integrated reporting tool has been streamlined and equipped with new features, including a more convenient method for transplanting Microsoft Excel data and more rapid handling of large pictures that benefits from heightened memory efficiency. For more information about SCIA Engineer 17, visit their website, https://www.scia.net/en/scia-engineer-17.